It's happened to us all. We are surfing online, browsing at the latest seasons of Louboutins. One way or another we end up on a knock off site, tempting us with the pretty pictures and cheap prices. We add all our fantasy dream pairs into our basket and hover over the check out button. It’s only the email from the boss that stirs away from our momentary weakness of actually making a bad, impulsive purchase. However, once in a blue moon, our desire gets the best of us, and we make the purchase. It’s always against our better judgment, but the thought of having a new pair of red soles in our closet wins us over, and we justify it with the less than fantastic work week. This is my experience of the bad decision I made in my moment of weakness. 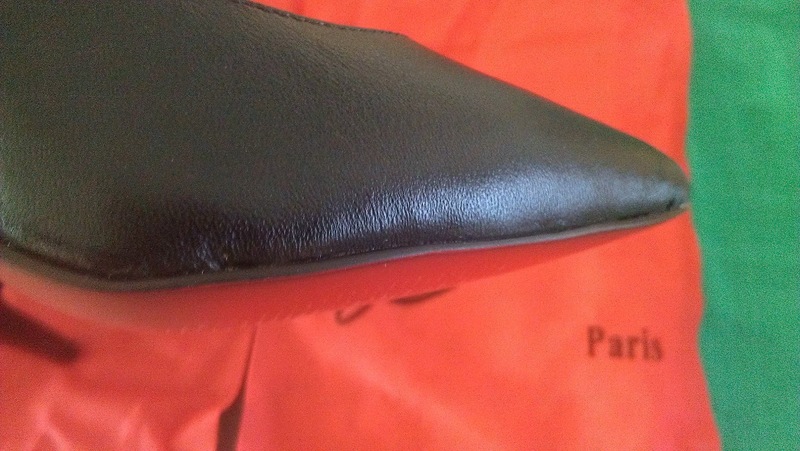 I made the purchase of these faux shoes from the Christian Louboutin Shoes Online Store in the hopes that they would not be too bad. 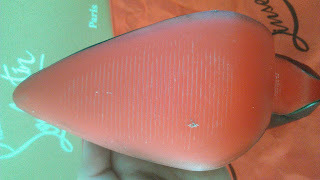 However, when I did receive them, they were some of the most poorly made shoes I had ever laid eyes on. 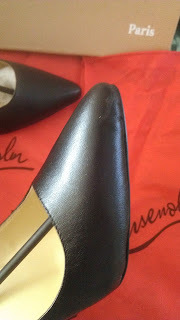 These made Payless Shoes seem like truly fine craftsmanship. Even the fake black spray painted leather (see the photo) felt like a sad attempt at very cheap pleather that would likely tear if I was able to wear them long enough that the incredibly thin spray painted red soles wouldn't get a hole in them. 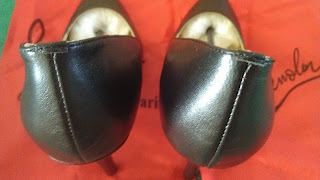 The seams on the back of the shoes was crooked and rippled and had a crappy piece sewn at the top of the ankle in their attempt to replicate the lip on finely crafted shoes. The "dust bag" is made of some weird papery tissue paper thin like material that smells like a cheap vinyl bag. I was offended for all shoes everywhere that I gave them my money to encourage this kind of horrible market demand. PROMPTLY emailed the customer service email that so happily and quickly took my Visa card number for payment, in order to get a return. "7. About exchange, return and refund. Customers can send shoes back for exchange, return and refund, the shoe should in brand new condition with all tags. Please contact us for return address, do not send shoes back to sender directly. 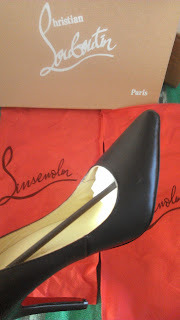 After receive the shoes from your side, we will exchange or refund for you." Free shipping to worldwide! Delivery is guaranteed. 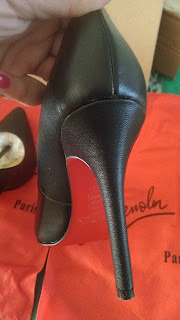 We ship Christian Louboutin shoes to anywhere in the world, usually send out within 24 hours. After sent out the goods, you will get a tracking number. In order to refund, the shoes should be in new and unused condition with all tags attached. Do not return to sender directly. Before return, please contact us at vogueonlinestore.service@hotmail.com for details and help. As instructed, I emailed for a return due to the dissatisfaction of their "product". They have since refused me a refund and offered me a mere 10% refund. This completely contradicts their own policy stated twice on their website. The long email exchange resulted in the refusal of the owner, Sue Morgan, to follow their own refund policy. I made several attempts to get my refund and return the shoes but stopped getting any response from them after the third email. I got screwed. This should be a warning to you all to never purchase anything from this site and to warn all your girlfriends of the same. 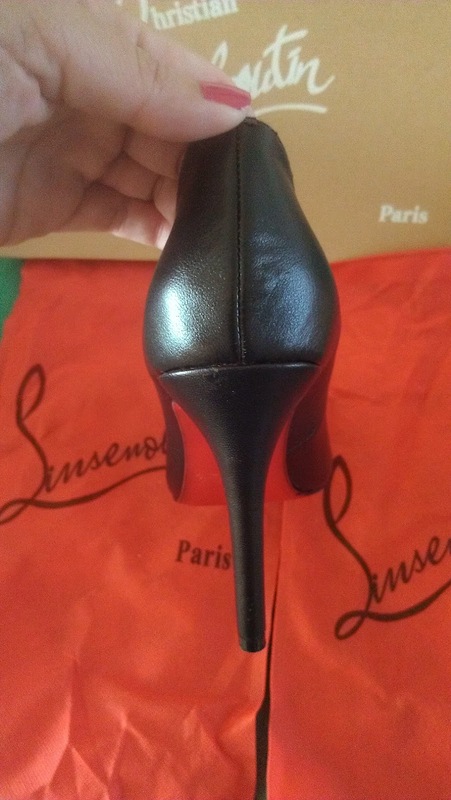 Please repost to your friends, email, post on Facebook and Twitter so that we can stop bad businesses like the Vogue Online Store from taking advantage of red sole loving women like us. My cheap knock-offs are going to make their way to a non-profit organization, Dress For Success, so that at least some lemonade is made out of this very sour lemon. Thanks a lot for this information. I have been meaning to order some shoes online, as well and it's more complicated since I have to deal with overseas freight shipping and all that jazz. I just love buying shoes online! 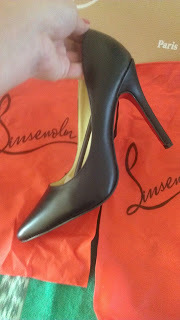 To be honest, I have collected so many shoes in which I bought and shipped to me online.